The 2010 State Farm Bayou Classic in The Louisiana Superdome. In addition to Saturday's game, a Friday night Battle of the Bands is the time for the bands to shine, and the accompanying Greek show features skits and singing from traditionally black Greek organizations across Louisiana. Also on Friday, a Super Job Fair at the French Market Exhibition Hall in the Hyatt Regency is what it claims to be, a job fair filled with a variety of employers seeking to connect with the student bodies of Grambling and Southern. Participants are encouraged to bring several up-to-date resumes and to be sure to dress for success. Unquestionably the most colorful manifestation in the annals of Black College Football, the annual gridiron clash between Louisiana rivals Southern and Grambling State, affectionately known to the world as the State Farm Bayou Classic, has become one of the most anticipated events in the nation. This event is an exhibition of the high standards of academic achievement deeply embedded in the traditions of the two institutions. 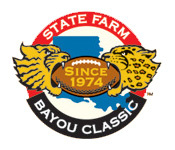 The State Farm Bayou Classic is more than just a football game. It is a unique family fellowship that exists within a football game, which has become in its colorful and glorified history, the greatest, most distinguishable sporting event in all of Black America. The gridiron match-up between Grambling State University and Southern University, two great Southwestern Athletic Conference (SWAC) rivals, represents the best that collegiate sports have to offer: teamwork, tradition, passion and fierce competition. The first ever Bayou Classic was played in New Orleans' Tulane Stadium in 1974. There were 76,753 fans in attendance to witness the birth of a unique and treasured pastime. Grambling defeated SU in that contest, 21-0. Southern leads the series 18-17, and Southern University posted an eight-game winning streak that ended in 2001 (the longest in the Bayou Classic Series). With the game's expansion over the years from Tulane Stadium to the Louisiana Superdome in New Orleans, LA, the State Farm Bayou Classic, including over 200,000 fans who descend upon the city to take part in the festivities, pumps more than $30 million into the New Orleans economy, annually. 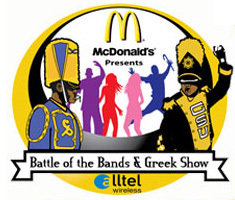 From the excitement of a sensational football competition, crowd favorite Battle of the Bands, to the gospel brunch, the event seeks to serve each and every one of its patrons, while assisting future graduates of higher education in locating postgraduate work via the State Farm Bayou Classic Super Job Fair. State Farm enters its twelth year as title sponsor of the Classic, which only serves to reiterate the pleasure, pride and continued growth of Black College Football's most legendary event. Celebrate the 40th Anniversary of ESSENCE at the 2010 ESSENCE Music Festival, July 2-4 in New Orleans. The ultimate July 4 weekend for entertainment, empowerment, culture and community that you don't want to miss! Buy your tickets now and get the best seats in the house. Plus, A special 40th anniversary offer: Get $40 off WEEKEND PACKAGE tickets available on Plaza and Lodge level tickets for a limited time. 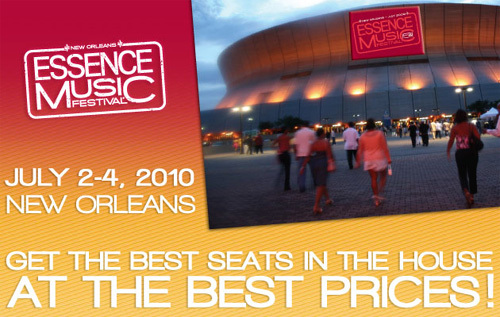 Get your tickets for the 2010 ESSENCE MUSIC FESTIVAL Best Prices are available for a limited time on weekend packages!